Hair loss problems experienced by many people, in general due to the lack of sufficient nutrients and vitamins to the hair roots. The conclusion is the lack of hair treatment. Inadequate intake of nutrients and vitamins, making the hair roots become brittle and cause hair loss. 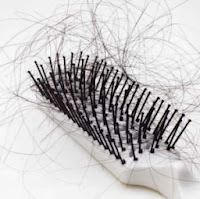 Whereas if the hair loss occurs in women, it is caused by many things such as overuse of dryers and curling irons, frequent use of chemicals on the hair, a result of free radicals, often tying the hair too strong and other things that can disrupt healthy hair. Stress that is too heavy, causing the nerves to force the hair root hair is getting weak and easily fall out. Do not tie your hair too tight. Avoid tying the hair tightly, hair ties that are too tight can pull the hair roots and weaken it. Avoid using heavy hair accessories. Use conditioner. Too frequent shampooing is actually not good for your hair. The resulting natural oils to protect the scalp hair will be eroded by the shampoo. It would be better if you wash it once in 2 days and always use conditioner. Using conditioner purpose is to reduce frizz and eases the process of combing the hair after shampooing. Wide comb when wet. It would be better if you do not comb wet hair. Wet hair, has a more fragile roots. If you do not want to frizz, use a wide comb to avoid loss. Remember not to rub too hard when drying your hair with a towel. Gently pat the excess water until the hair is reduced. Use hair serum. Often use vise or hairdryer? So do not ever forget to use a hair serum specifically formulated as a hair protector of various hair styling tools. Use of serum is also necessary to protect hair from pollution and harmful effects of sunlight. Natural oil treatment. To get the hair strong, not easily broken and fall off, do natural treatments that have been proven from generation to generation. Use olive oil on your hair, coconut oil also has been proven to make hair healthy, strong and shiny. Do this treatment once a week and see the results. Following tips may also help you. Tips to prevent hair loss with aloe vera. Aloe vera contains vitamins and minerals, which is useful to enrich and thicken hair. To use, you can take aloe vera, cut into two parts to be taken the mucus. Apply on half dry hair while massaged. Let stand for 15 minutes then rinse thoroughly. Overcome hair loss using celery leaves. Celery turned out to have some useful content for the hair including calcium, iron, sodium, vitamins A and B. Celery can stimulate hair growth to be more healthy, strong and shiny. Take a few sticks of celery then clean, and blended with whipped egg. Once all mixed, apply gently on hair while gently massaged. Let stand for 20-30 minutes then rinse. Olive oil and honey. In a container, mix 5 tablespoons olive oil and 2 tablespoons of honey, stir together. Then smear the mixture to the hair. Bandaged head with a shower cap, let stand about 15 minutes, then rinse. Do it at least once a week. Avocado (for dry hair). Avocado is rich in fatty acids and nutrients. The trick, crushed avocado in a bowl, and stir until it becomes a thick paste. Then, wipe the hair from the roots to ends of hair. Then let stand for 20 minutes. After that, wash hair with shampoo, then rinse. Hair loss treatment with green tea. Green tea contains antioxidants that are beneficial to protect hair from pollution exposure. Jasmine tea useful to make hair shiny. Mint tea beneficial for soothing the scalp and remove fat and reduce dandruff and itchy scalp. By brewing tea with hot water, and let stand overnight. Rub the tea water to the scalp, do just before shampooing.